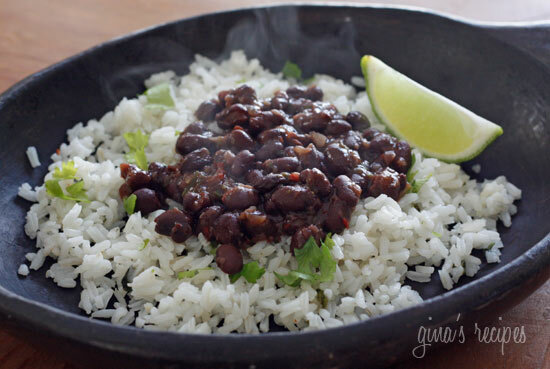 Get your Latin groove on with these Cuban inspired black beans, loaded with mucho sabor (lots of flavor)! Easy to make and ready in twenty minutes, but don’t let that fool you, there is plenty of flavor in these beans. Low fat, super high in fiber, vegan, gluten free, inexpensive and delicioso! I love to mix and match Latin dishes from different Central and South American countries to create dishes with Latin fusion. Try this with some of my Latin favorites such as Cilantro Lime Rice, Barbacoa Beef, Sweet Barbacoa Pork, Mexican Slow Cooked Pork Carnitas, Slow Cooked Pernil, and Chicken Ropa Vieja, to name a few. So pump up the salsa music and get cooking!! Add oil to a medium-sized pot on medium heat. Add vegetables to the pot and saute until soft, about 3 minutes. Add beans, water, bay leaf, cumin, oregano, red wine vinegar, salt and black pepper and bring to a boil. Lower heat and cover, simmer about 15 minutes stirring occasionally (adjust water as needed). I usually don’t like black beans and skip them for my recipe but decided to give it a try to go with the carnitas. But oh my gosh ist was worth making! So very very delicious! Are you supposed to use a slotted spoon to drain the beans in this? Or do you use the liquid also? Can’t wait to try it! I am Cuban and grew up on black beans and rice and these are better than Mami’s…shhhhh don’t tell her. Amazing! Constantly requested by family. Yummy but not sure if its healthy to put bean water in from can. Just wanted to say that I made this last night and I’m craving it again today! It was so easy to make and we all went back for seconds. I made it exactly to the recipe, and added a sprinkle of some Epazote seasoning I had from Penzeys (had bought it on a whim and never used it – it says it’s used typically in bean recipes)perfection! I make this all the time. It’s so easy and so yummy. It’s great to make ahead and use for lunches for the week. Your recipes really are the best. I never doubt that they will be delicious, you’re the only blog I can 100% count on. Thank you! These are always a hit in our house! This time I did not have any scallions so I substituted one jalapeno (seeds removed) in their place and it gave it a nice bit of heat, without being overly spicy. 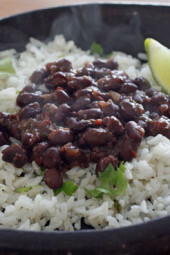 Gina-this is the black bean recipe I have been searching for! My 5- and 7-year old boys ask for seconds when I make them — and they turn their noses up at the black beans at most Mexican restaurants. Thank you!. It has changed dinners around our house (especially Meatless Mondays!) Anytime I can get a healthy source of protein and fiber into them I’m thrilled! I love this recipe. It is fast and easy and hands down the BEST black bean recipe I have ever made. The addition of red wine vinegar is genius. I have always drained and rinsed my Beans – big mistake. Thanks. Made this tonight. It was so good!! I love your recipes. So often when I look up a healthy recipe somewhere it lacks in flavor but this was delicious! I wish I had doubled the recipe so I’d have some leftovers. I’ll know better next time! I’m making this right now and it looks delicious but awful sleep stupid I’m wondering if I should strain it any suggestions? so easy — we make these all the time and it’s really helped get more beans into our diet. Gina….this is probably a really silly question, but if I wanted To make these ahead of time for entertaining, would you prepare them just like the re pie and then just keep them warm in the crockpot? Would they dry out? Thank you! Sure that would be fine, if it gets dry add a little water. I think better at the end to, after the initial simmer, uncover and boil away the water until it’s got a less soupy consistency. That’s just me, though. can you sub balsamic vinegar for red wine? I used the dried beans, because they are more bang for your buck, and you get a whole pot full of beans. Left overs are great in a flour tortilla for a breakfast burrito, as I am not a typical breakfast eater, and it starts my day with protein! Other than cooking my beans from scratch, I followed the recipe, and just bumped up the ingredients a bit, to add for the extra amount of beans. Great Recipe! I was just comparing this recipe to your Brazilian Black beans, and was wondering why this recipe is 1/2 cup for 3pp, whereas the Brazilian black beans is 1 cup for 3 pp – I would have thought the Brazilian black beans were higher in points because they have the smoked ham? Are they lower in points because you start with dried beans? Are canned beans higher in points. Sorry if I am missing something, just a little confused! Thanks for clarifying (and for the great recipes!). Hi, Gina, you are absolutely right! Never, ever, drain black or red beans in Cuban cooking. If people are worried about sodium, they can buy low-sodium canned beans or make dried black beans.The best way to add water to black beans is to use the empty can of beans and take advantage of any liquid left in the can. Cuban black beans are moist – not soupy – but they should have a thick liquid sauce. The sauté of onions, peppers, and garlic (called "sofrito" in Cuban cooking) is what adds flavor to black beans and many other Cuban dishes. Traditional Cuban black beans are made with green peppers. We usually saute no less than 5 minutes. Traditionally, dry white wine and white vinegar are added. I usually omit the white wine because my husband was a diabetic, but don't skip the vinegar – 3 tablespoons. I use white wine vinegar or apple cider vinegar, since I don't use wine. 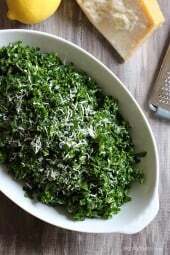 Do use oregano and cumin, but cilantro is only used as garnish when serving. The bay leaf goes in whole and is removed before serving.I also use onion and garlic powder to increase the flavor. I cook the beans 30 minutes to an hour. Beans made the day before, refrigerated, and reheated with a little water or chicken broth have a great deal more flavor. Drizzle a little olive oil over the beans before serving. Also agree that white rice is the rice of choice. Basmati or jasmine rice work well too. I've tried it with brown rice, but it just doesn't work for me – it's just not how Cubans eat black beans. There is a great website called Three Cuban Guys in Miami that has authentic Cuban recipes in English. They address the issue raised in one of the comments in your Congrí recipe. Congrí vs Moros con Cristianos. I realize that the goal is to adapt recipes to make them low calorie, so I understand, just adding my two cents of experience and native knowledge. –Cuban Mama struggling to cook Cuban food in the Deep South. Awesome! And I agree! I love Cuban food, eat it every chance I get, especially in Miami. Being half Colombian, we never drain the beans if serving over rice. Made this (and the rice) for a Mexi theme potluck and loved it myself. Will make again. I didn't add any water 'cause I like it thicker. I just made this with the cilantro lime rice. Sooooo good! I'm not the best cook, but to my amazement, the meal came out just as good as the rice and beans at my favorite Cuban restaurant! Is the bay leaf an important part to is recipe? If so, do you leave it whole or chop it up? Do you take it out before serving? I've never used bay leaves in my cooking so I'm a little confused. 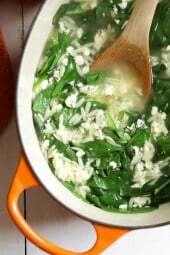 When you use bay leaves in recipes, you leave them whole and take them out before serving. We are big bean eaters in my house! This is exactly how my Cuban mother inlaw makes black beans. These were pretty good. I didn't have the red bell pepper, so I just left that out. All in all, not bad. Make this for a friend who talked about Black bean she had in Costa Rica. She missed them so much I decided to make something close to it using this recipe. I made them for her, and she loved them. She said that they were just like the ones she had when she was away. Thank you so much for such a wonderful meal! Hi Gina! I love your website and your recipes! I have made these beans twice. The first time I didn't add the water (just forgot) and I didn't have onion on hand to add. I liked it much better this way and thought it had a lot more flavor. Just a tip for those who want to make them 🙂 I've used them in burrito bowls with your carnitas, corn salsa, and cilantro lime rice. I have used them in a Mexican layer dip (with the leftovers) And I have ate them over whole grain pasta. Yummy and so versatile! I have made a dish like this for a few years and love it as is! To please my meat-loving husband, we add in sliced smoked turkey sausage and top with hot sauce and cheese. This has been a go-to website for my weekly meal planning and I have reccomended it to all my family and friends. Love that I can find most of the ingredients at my grocery store!! I'm wondering if anyone has had a version of this with coconut milk? My friend from Haiti makes a version that Is amazing but she is a cook that doesnt use recipes so she can't really tell me what she does. All I know is she fries up some shallots and black beans in oil, then must add some sort of seasonings with water and coconut milk and rice. The pot sits on the stove for an hour or so. Would love to know if anyone has a more specific recipe for this? It's so good!! this was incredible. (when cooking, i cut back on the cilantro a tiny.) but seriously, this was incredible. we love this recipe. Even my 5yr old loves this. We use the beans in place of beef for tacos and I like to make a taco salad with lettuce, beans, tomato, cheese and avocado. If we have them in the house top with some tortilla chips. Great recipe. Chipotle is my absolute favorite and I have missed it since moving to Canada and the rice is a very close match in my opinion. Brown rice does not taste as good though. Just made this for the first time and it was a hit with myself and my husband! Great recipe! Black beans are really hard to find in Australia so I made this with red kidney beans instead. I'm sure it would be 10x better with the black beans but it was pretty good with the red kidney beans. I just found out I LOVE black beans!!! Really I JUST found out! Searching your site fore more recipes with them! This is top of my list! I made these with canned low-sodium Bush's black beans. I followed the recipe to the letter and they turned out very bland. I added some spices, but the beans themselves didn't absorb any of the good flavors. I think I'll stick to full-sodium and just enjoy a smaller portion. Thanks for posting! I would say skip adding the extra water, I did that by mistake once and it had a much better flavor. I've made it exactly as written as well. It's also just fine without the onion. Hey Gina – we made these black beans last night with the slow cooked pernil…I cooked the black beans in the crockpot, just threw all the ingredients in there and let it sit for 4 hours on low and they were so yummy! We served everything with rice, cheese, scallions, red onions, tomatoes and sour cream – we had the family over and everyone loved making their creations =) Just another AMAZING recipe of yours!! Gina – I just made your slow cooked pork carnitas, these black beans and the lime cilantro rice for dinner. My husband raved, I raved, we're still raving – this is better, in our opinion, than what we get at Cuban restaurants down here in Florida. Thanks so much for your website – you and your recipes are brilliant. 🙂 I'll be trying many more! I love your recipes and your presentation my mom recently was told that she needs a heart valve repair and I love your recipes and I know that your recipes don't all show the sodium content. How can I figure it out? Help thanks and have a safe and wondeful New Year! This was crazy good!!! I made it last night with the Cilantro Lime Rice as is pictured, only insead of white rice, I use the long grain brown rice. I loved it, and my ten year old son ate his share as well- I will definitely make this again! Healthy, quick, very filling and inexepensive! A real winner!! I had Cuban style black beans on my mind, but very very little time. I knew just where to go for a recipe. As always Gina thank you for such a quick and nutritious dish. It is delicious! I made this last night with the Cilantro Lime Rice and Garlic Lime Marinated Pork Chops! It was heavenly! This recipe will now be in heavy rotation! I love this site. Since trying this dish, it has become a weekly item on the menu! I do not add the water, i found that it makes it soupy. I am not sure if it affects the points plus, but it will remain on the menu. Me and the husband absolutely love the dish. Thanks Gina! i followed recipe to the t it turned out like soup what went wrong.should it be thick or soupy? don't add the 1/2 cup of water to it and it should be perfect. I prefer my beans that way, that's commonly how many latin countries cook their beans, but if you rather not have the extra broth, leave it out. Emily, a vegetarian who cooks meat! I'm so glad you all enjoyed them! YUM YUM YUM!!!! I made this last night with the Cilantro Lime Rice and also made the Chicken Ropa Veija for my hubby (I am vegetarian, but he is not) and Oh. My. Gosh. was it delicious! This is a superb recipe! We had it last night for dinner and everyone loved it. My kids and my husband gobbled them up. I am from Miami and have missed my Cuban black bean. This helped my craving. Will definitely make again and again! Thanks! Simple and delicious! I also rinsed the beans and added low sodium chicken broth instead of water. YUMMY! Brooke, I never liked beans, so I really had to add tons of flavor for me to like them. Thankfully I love them now! These were so yummy. I had it with some fresh queso and a flour tortilla (a real one). I'm even taking some to my friend at work for lunch tomorrow! I can't wait to make it again. This was soooo good! I don't ever want to eat plain black beans again! Glad I could accomodate! And thanks for sharing all your favorites! Thanks, Gina, for providing guidance on my freakish need to rinse canned black beans. I just made the Cuban Style Black Beans for dinner and my husband loves them! The only thing I altered was the water. I had some leftover chicken stock, so I tossed that in instead. Very easy and very quick. We've tried the following with great success: Buffalo chicken dip (super bowl must-have!! ), asian drumsticks, pumpkin spread, pork chops with dijon herb sauce (fantastic!) crock pot santa fe chicken. Each of these make regular appearances at our dinner table. Thanks so much, Gina, for being our culinary guide! This was a fabulous way to doctor up canned beans!!! LOVED IT with the Lime Cilantro rice and the Pernil!! This was AWESOME! Probably one of the most flavorful black bean recipes I've tried. I had to use dried cilantro. I increased the garlic. This paired fabulously with grilled chicken tacos. Keep the recipes coming! Made this last night with the rice recipe you posted… got a can of fresh corn and some other toppings and my hubby and i loved it. the beans are awesome! This is one of my favorite quick dinners! I actually learned the recipe originally from a Cuban friend and my non-vegetarian family fell in love. Debbie, I personally would not rinse the beans, I only rinse them if using in salads or eating cold. But if you must… Add more water, maybe 1/2 cup more? And simmer a few minutes longer. Lisa, glad you liked them, and I assumed everyone makes their beans like this!! I almost didn't post this but husband insisted! Gina you are the BEST! I love wraps so I took a couple of the ww wraps and put some rice/beans added cheese and sour cream and SO GOOD! As someone who is trying to cut back on meat, I love this and would have never in a million years thought of making black beans this way.. I've tried a few of your recipes and each has been a hit at my house! One question for you – suppose I'm a freak about rinsing canned black beans, what adjustments would you make for the recipe? Add a cup of water? I made this last night, along with cilantro rice. It was soooo good! In fact, I'm eating the leftovers for breakfast right now. It's even better the next day. I added some avocado slices to the top of this dish. I will double the recipe next time so my non-vegetarian hubby and son can have it with grilled chicken. Thanks for sharing this delight! My daughter and I love it! Melissa, my husband who loves beans would agree with your chef friend! Thanks for leaving a comment! Just made this tonight for company with grilled chicken. Yum! My friend who is a chief said they were restaurant quality and asked for the recipe! Thanks Gina! My nutritional info was off, I just updated points to correct number, 3 points plus. Our leader said that we were NOT to count the "free" foods when making a recipe. She said to only enter the foods that had points in the Recipe builder….to leave out 0 point foods because even though they have calories, fat, etc WW has determined them to be "free". Dalis, you could leave the vinegar out, I don't think red wine works. Cookingmommy, I calculate all the nutritional info, even 0 point ingredients, then plug the final numbers into my WW calculator. Even though some ingredients are zero, they still have calories. And sometimes they are only 0 depending on how much you use. But I will double check my points to make sure there is no error. Yup – that would be quick and delicious – I had no idea it was Cuban… but, great photo. I adore black beans – these look great! I don't know what took me so long to find your blog but I am sure glad that I did! I've been WW lifetime for 14 years and just want back to check in with the Points Plus system. I love it! 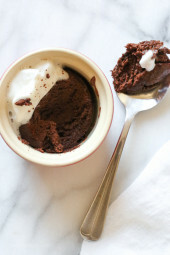 I can make something new each and every day with all of your awesome recipes here. Just came back from the grocery store and will be trying Crock Pot Santa Fe Chicken, Crock Pot Chicken Chili and Chicken Pot Pie Soup for the first ones that i try out. I see a connection here..Thanks so much! My 4 year old son is a huge fan Chipotles black beans and lime-cilantro rice. We are moving this summer to a small town (without a Chipotles). I'm so glad I'll be able to make this at home!! I'm trying both recipes tonight! I'm a huge fan of all black bean dishes, brings back happy memories of traveling in Costa Rica. I've never not drained canned beans, I bet it keeps lots of good flavor in. Great idea! Can't wait to try this! Gina, this looks delicious! I love black beans. My question is: how did you come up with 4 points per serving? Black beans are only 1 point per 1/2 cup and the only other ingredient I see that isn't "free" is the olive oil and that's 4 points for a whole Tbsp. I am figuring 2 points at most for 1/2 cup. This is how I always figure in my recipes. Do you count the total calories and fat and fiber even if you have 0 point ingredients? Thanks. I am using old points, by the way. gina, thanks!!!! My hubby likes the black beans but I keep treating them like red beans and he says it doesn't test right, so I'll try your recipe. One question, is red wine a good subs for the red wine vinegar? Or should I use a bit or red wine AND vinegar… no red wine vinegar in the house. No, I would use white vinegar instead. So funny you are all asking for the dry bean method, every time I post a bean recipe with dry beans I get asked how to make it with canned beans! If you use dry beans, 1 cup dry will give you about 2 cups cooked. Lisa, I'm not too familiar with Simply Filling, I wouldn't want to make an error. Matt- I should mention I also have a baked tostones (plantain) recipe, great with black beans! Thanks for sharing this recipe! I live down the street from a Cuban sandwich shop and their black beans and plantain chips are to die for! I think this recipe might come close to theirs, so I'm excited to try it. I think I'm going to try to use dry beans to make it, and just save about 1/2 cup of the bean cooking liquid to use. Do you know how to translate canned beans to dry ones? So, what quantity of dry beans to make one can of pre-cooked beans? I'm sure this is obvious and maybe I'm just covered with a brain cloud this morning. Sounds delicious though. Since we all think cilantro tastes like soap in this house, I think I will try a mix of mint and parsley or whatever looks fresh at the store. Not sure, but you can make extra and save he rest for another meal. This will help convert dried beans to canned amounts. I had dried, not canned, so I’m using 1.75 cups cooked beans, drained (but I’ll reserve the liquid). Hi Gina, Love everything I have tried so far. Made the Pernil twice already and everyone loved it. I was wondering, so many of your recipes have all power Foods in the and can be marked as a Simply Filling Technique (old Core) recpe would you consider making a secton for those kinds of recipes for those of us doing Simply filling. If not I am still loving all you do and I tel everyone about your site. This looks great, but I would have to drain them or use dried beans that I have cooked. The extra sodium in undrained canned beans is too much for my diet. Thank you for keeping the old points system too. I have tried the points plus system and am having trouble with it. Yes, 1 15 oz can of black beans, do not drain. Melissa that was a mistake, thanks for noticing! Updating now! Hi Gina, I've been trying to cook a few different latin recipes in the last little while, this one will definately be tried in our house. Have a great week. This looks great! I am going to have to try this with the pork Barbacoa soon in my line up, thanks for sharing. This sounds great. My family loves beans. I especially love black beans. The only downfall is the after-effects it has on my husband! hahaha! 😉 I will add this to a future meal plan of mine though. thanks for sharing! Is that a can of black beans? Drained? Mmmm…I love black beans and rice! Looks good. Vegetarian, delicious and easy… that's my kind of recipe! Oh, I need to get myself to the store!!! Looks awesome!! Do you start with canned or dry beans? Canned beans "15 oz can black bean, do not drain"